Top 5 Reasons You Should Attend D23 Expo 2015! If you have been reading my blog for a while, you are aware that I am attending the D23 Expo 2015 in August. I’m not just attending. I am beyond ecstatic to be going. I have had many people, who are unfamiliar with it’s fabulousness, ask my why I am going and what’s the big deal. Perhaps you are wondering the same thing. I have decided to compile a top 5 list of reasons you should attend D23 Expo 2015, to help out all the people who might be on the fence about going. If you are a Disney fan, this is the ultimate gathering of Disney fans!! You might think that going to a Disney Park is the ultimate gathering but not everyone at the Disney Parks is a fanatic. If you take the time to attend D23 Expo, you know you are amongst others that share your passion. You will meet lifelong friends that will never tease you about your love of Disney. 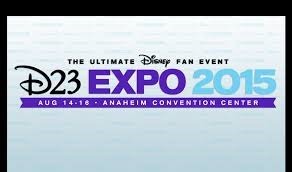 If you attend the D23 Expo, you will get a first look at upcoming movies, merchandise, tv shows…. before the general public! You will be able to know what your next Disney obsession will be, far before other Disney fans. I’m looking forward to seeing the merchandise (shocking) but also the plans for all the new movies. I love having movie countdowns to the next big release. Inside Out was my most recent obsession and, when I went opening night, I loved it. I can’t wait for all the sneak peaks in store. Names that any Disney fan will recognize may be at D23. As of right now, I cannot even narrow down who I am more excited to see. Bob Iger, John Lasseter, Kristen Anderson-Lopez and Robert Lopez…. just to name a few. I mean there will be broadway legends, ABC family cast members… this is your opportunity to see some legendary Disney figures. Where else can you do that? I’ve already told you about some of the new merchandise being released at D23 Expo, like Pandora charms and Alex and Ani wraps. There is, however, a ton of other merchandise to be found with all kinds of vendors ready to share their Disney goodies! There will be things there that you didn’t even know existed and that you may not be able to get elsewhere. I have every intention of walking around and talking to all the vendors and letting you all know what it out there!! If you want to know as it happens, you can follow me on Instagram, Pinterest and/or Twitter @ 4disneyfashion. Remember, this is the Disney Fashionista writing this article… of course I think the Minnie style lounge is a reason to attend the D23 Expo 2015! The Minnie style lounge will feature a nail bar and surprise product giveaways along with an inspired fashion and accessories statement. I will be first in line! Those are my top 5 reasons to attend D23 Expo 2015 but perhaps you have a different reason. Let us know your reasons for attending in the comment box below. See you there!! Meet Your Favorite ABC Family Stars at D23 Expo 2015! Frozen Sing Along, Special Guests And More At D23 2015!